So after saying all week that I was going to go for a run today, or tomorrow, I finally made it happen. It wasn’t pretty and it was slow but I did it. I wore a specific race T-shirt to remind my legs that they have gone the distance and they still can. I just hope the next time I run isn’t another week from now. I’ve been in a funk lately and it’s really starting to annoy me. I’ve been struggling with a groin strain, likely an overuse injury from running. 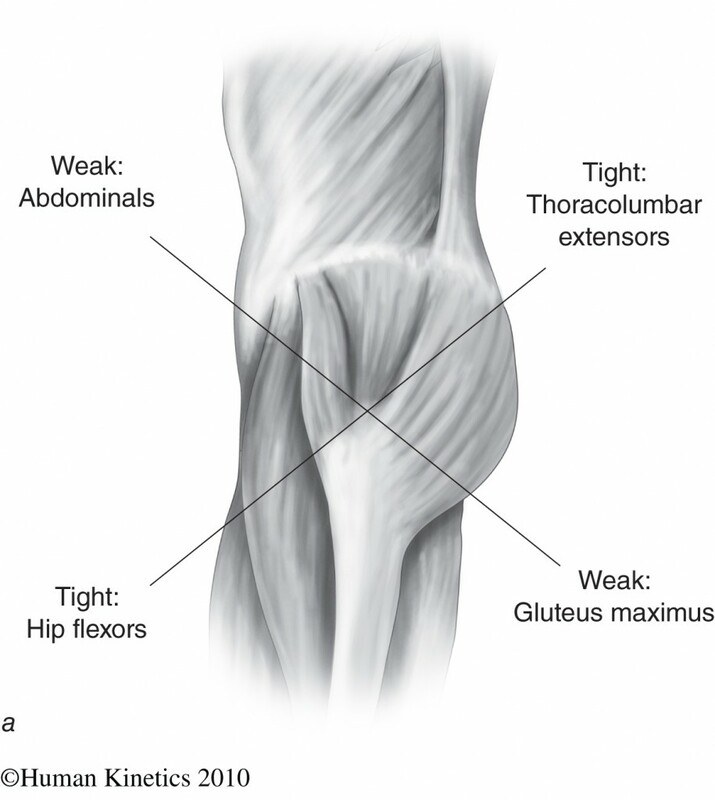 My hip flexors are not happy with me and despite active release therapy and a week of rest, it still isn’t better. I ran for the first time this week after 8 days off and by the end of the short and pathetically slow 3 km, I was having discomfort. I’m even feeling the discomfort walking around today. The half-marathon is 3 months away and I am seriously considering selling my bib as I feel like this just isn’t going to get better. I also suddenly realized that I desperately need a vacation. I have two weeks off coming up and am looking forward to it but it will hardly be that restful with three kids in the country. I shouldn’t complain. I know that. The kids have been waiting for our annual trip to the cottage we rent and they are going to have such a fun time. I just don’t anticipate feeling all that rested when I return. I woke up this morning to find that some a#**@e ripped out a stalk of my beautiful sunflowers. Why would someone do that? Makes me want to pack up my house and move. This is the second time this month that my garden has been vandalized. I love my neighborhood but there are some unsavory characters just a block or two in all directions from my house and it’s disconcerting to know they are walking the streets at nighttime messing with my flowers. I really love those sunflowers. I thought I’d feel better after writing this all down. Perhaps a Starbucks Frappucino will do the trick. 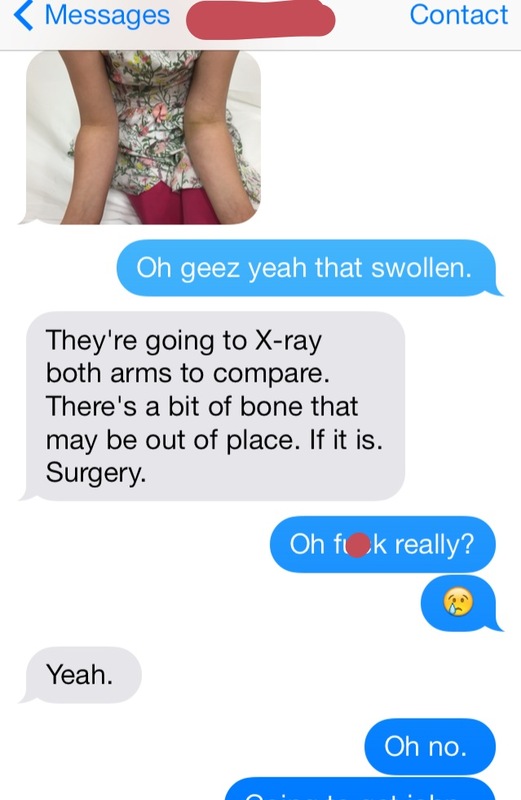 Daughter had her fracture clinic follow up this afternoon. I had called this morning to book the appointment only to be told it was already booked and it was in a few hours. Say again? No one from the hospital called us, it’s only been 5 days since she was seen and yesterday was a holiday, so how can she be booked already? Sigh. 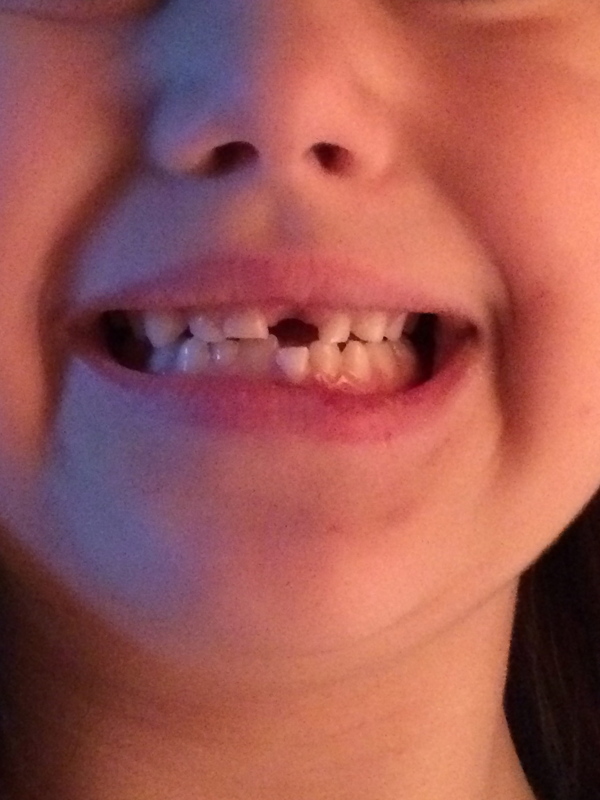 Thank goodness her dad is at home. I called my mom to see if she could come over to watch the baby and then called daughter’s school advising them that she was being picked up early. Husband texted me from the clinic that it was busy and he would be late picking up our son from preschool. I re-arranged my patient bookings so I could pick him up and take him home. As I was about to leave to get my son, I received this text from husband. I hated that I wasn’t there for my daughter. I called husband and told him my plan of getting our son, taking him home to my mom and then coming to the hospital. I was going to cancel the rest of my day. I spoke with my little girl and she was obviously crying, “I don’t want surgery, Mommy.” I tried to be as calm and upbeat as I could telling her that the doctors weren’t sure yet and we needed to wait to find out what the x-rays showed. Hubby then took the phone away and said they were going for the x-rays and hung up. I got home about thirty minutes later and anxiously waited for news. I kept telling myself that its not a big deal if she needs surgery, after all husband had a similar fracture when he was 12, they would have matching scars! But the thought of her being put under a general anesthetic and having her skin cut open and her bones screwed back together – ugh, it was awful. Finally, I got service back on my phone and a flurry of texts came in. I gave her the biggest hug when I saw her and her fancy new cast. The bright side of injury. If there’s an up side to being a doctor who runs and gets injured it’s learning about the new therapies out there for sports-related injuries. I had my second chiropractic treatment yesterday for my lower back/hip issue. Since my first visit over a week ago I have felt about 80% better. Unfortunately there wasn’t much change in the range of motion of my left hip joint. He suspects I have a deep ball and socket joint, meaning I was born this way and will just have to accept it and work with it. After a rather vigorous ART therapy session he decides to use a Graston tool on my tender fascia. You can see it has a few different edges – one sharp, one dull and one somewhere in between. The traditional method of working the fascia left patients battered, bruised and bleeding, this according to my chiropractor who told me the history of the tool. Honestly I don’t recall a lot of what he said, I was too focused on bracing through the new sensation of this tool working on my fascia. It didn’t hurt per se, it was more of a grating sensation. an instrument-assisted, soft tissue mobilization therapy. It is beneficial in breaking up fascial restrictions, scar tissue adhesions, and detecting areas of chronic inflammation and/or fibrosis. Graston has been known to help conditions such as a cervical sprain/strain, tennis elbow and golfer’s elbow, lumbar sprain/strain, rotator cuff tendinosis, and even Achilles tendinosis. At the end of treatment my skin felt raw and was red. I expected to wake up today completely bruised but I wasn’t. The area is sore today but not nearly as bad as I expected. Apparently there is no real consensus on what causes fascial pain or why working on fascia relieves pain. But talk to any athlete or casual runner and they’ll tell you that manual therapy on their fascia worked. Confused yet? I certainly am. I read this article on fascia science and I am still not clear on anything. I have no idea what is ultimately the cause of my pain but I do know that after ART and this Graston tool, things are feeling better. In the end, it doesn’t matter that the science of fascia is still iffy. What matters is that therapeutic tools have developed that help patients feel better. 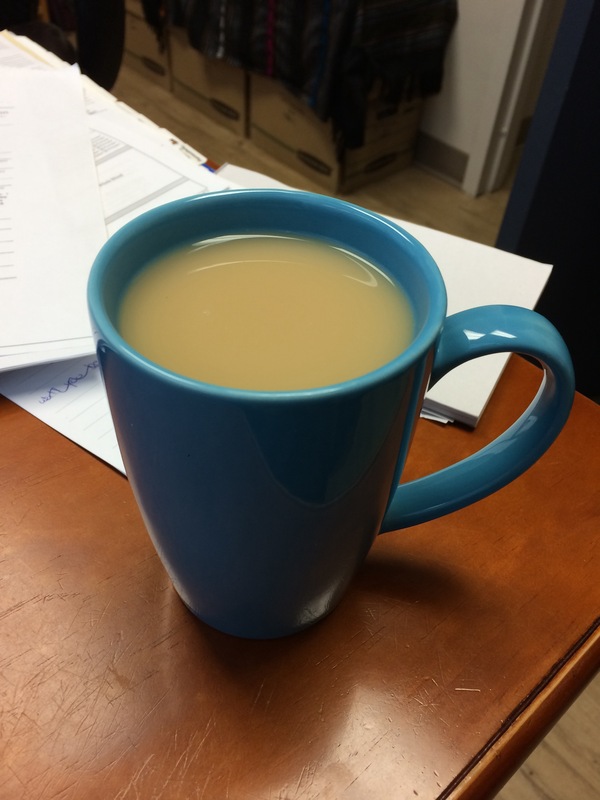 A Pain in the …. 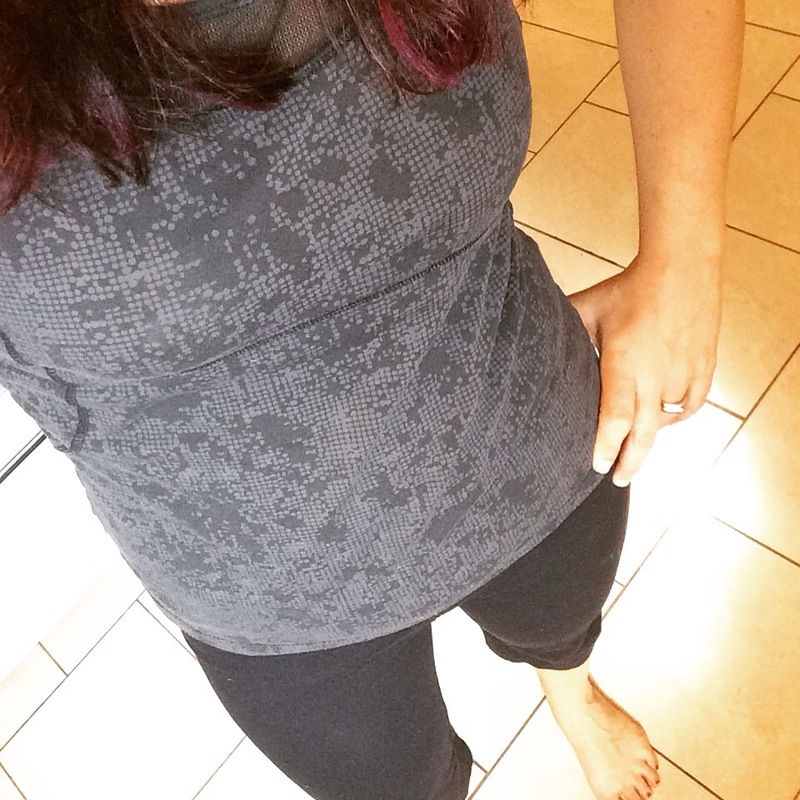 About a week before the 5K race I started noticing a subtle ache in my lower back. It’s been there on and off in the past, mostly related to the pregnancies but this time it wasn’t going away. I felt great during the race and after but in the week that followed the ache turned into something more. Then I chalked it up to the monthly cycle low back pain but it didn’t go away when the monthly cycle left. It started wrapping around to the front, near my hip bone. I thought I had been doing so well. Apparently not. I saw a massage therapist who suggested I see a chiropractor. I had been thinking about getting into some ART therapy. 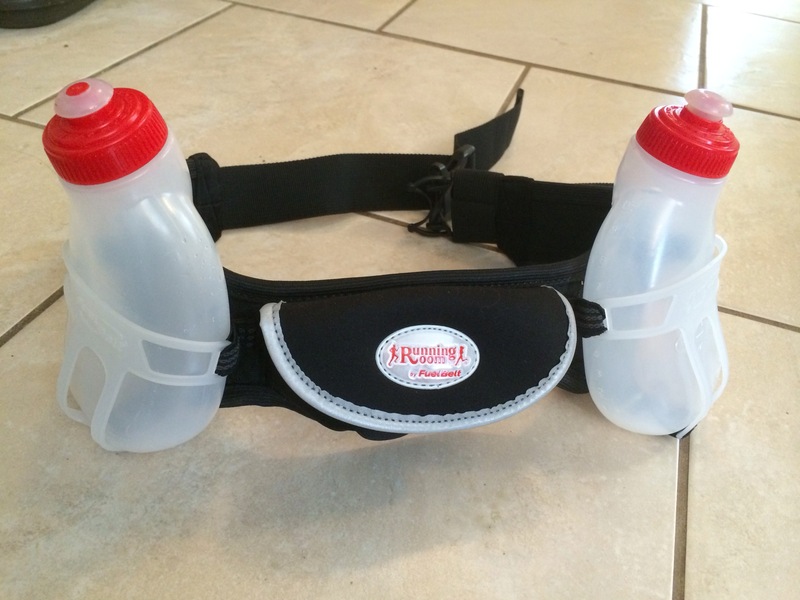 I had heard about this from the FB running group I follow and heard it was pretty good for soft tissue injuries. Now, the last time I saw a chiropractor was probably close to 20 years ago and it involved a lot of back and neck cracking. I wasn’t too keen on going down that route. I was pleasantly surprised by my experience with this new chiropractor. He assessed me quickly as having very tight hips which were due to weak glutes. Pretty much exactly as I had suspected and he went on to do some active release therapy on my hips. I have incredibly tight hip flexors. And this pretty much sums my situation up. After 15 minutes of active release therapy, all I can say is “owie” and “wow”. At the end of the session my lower back and hips, while still aching, felt 100% looser than when I went in. Sadly that didn’t last but I have been working hard all week on stretching and opening up the hip joints. I have a lot of work to do. I am going to scale back on the distance and stick with no more than 5 km runs for a few weeks until this settles down. I mentioned previously that I joined another blogger in a 1000km running challenge. We are going to try to run 1000km in 2015. Breaking that down means that I would have to average about 80km per month. That seemed a lot to me, especially with the on and off injuries I had in 2013. Well let me say that January has been a fantastic month for running. I have incorporated weighted quad sets (20 lbs) on the off days and have noticed a huge difference in the strength of my legs. The knee doesn’t ache anymore and the shin splints are gone. My speed has improved as well. 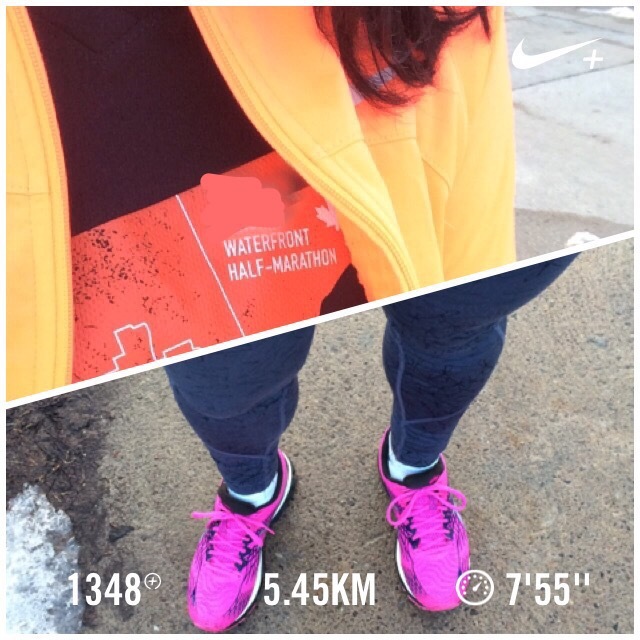 The first half of January saw me running a series of 5km runs (from work to home). 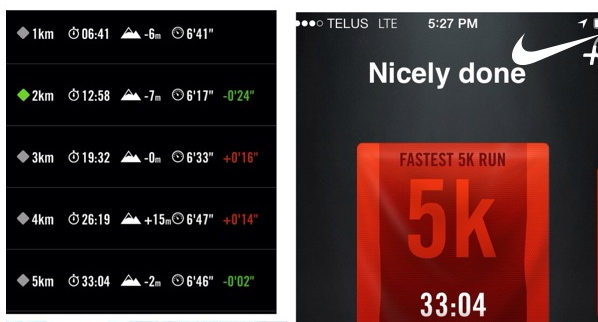 One of my goals this year was to run 5km in 30 minutes. I haven’t quite gotten there yet but the last few 5km runs I have broken my own personal best record twice, in the same week! 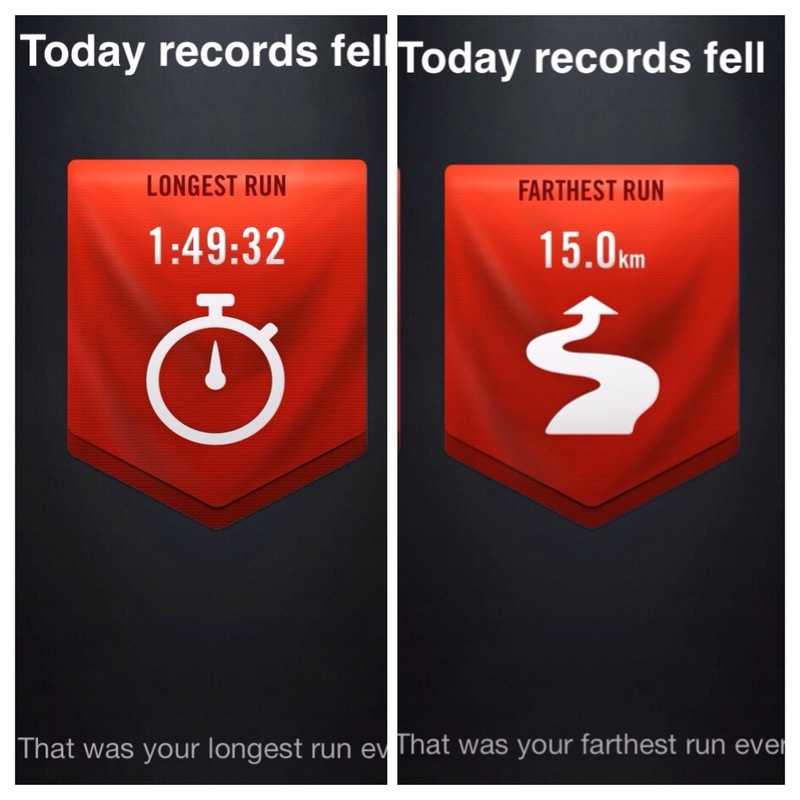 I’ve only done two long slow distance runs this month. 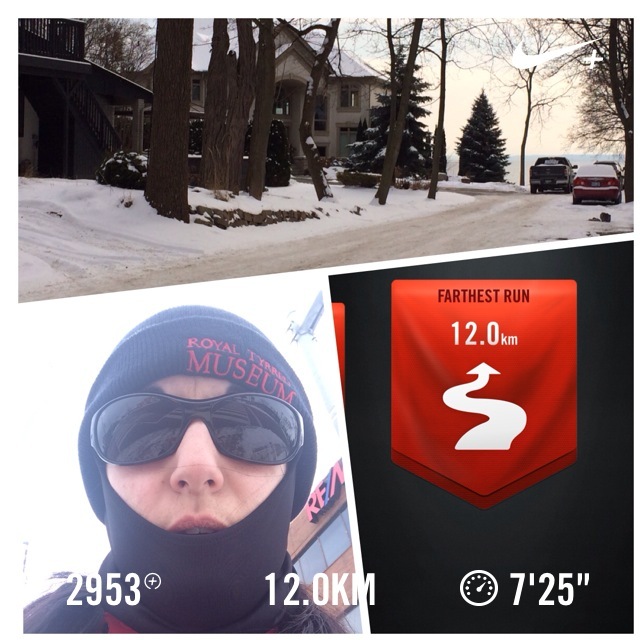 The first was the 11.1 km a few weeks ago. Yesterday was the second. 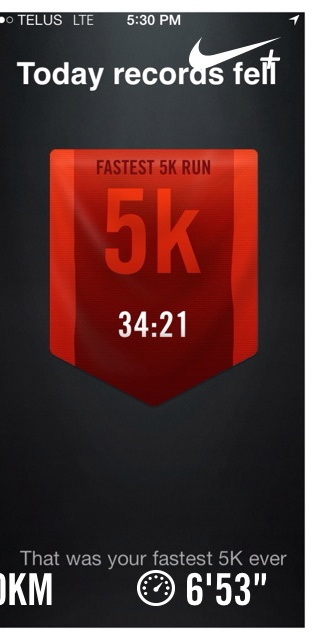 My online running group suggested that I try to incorporate one LSD per week to help me reach my goal of the sub-30 minute 5km. I didn’t tell them this but one of my other goals for the year is to run a half-marathon distance. Again, I’m not signing up for any races so there isn’t really a time constraint, other than I have 11 months to reach this distance. So while the kids and I were visiting my in-laws, I took advantage of the extra childcare and set out on a long run in a city that isn’t all that familiar to me. I mapped out a 10km route but got a bit distracted by the scenery (million dollar homes along the waterfront). It was really cold and my cheeks were frozen by the half-way point. I wanted to quit several times. I needed a few extra walk breaks, not for my legs, but for my breathing and thank goodness for traffic lights. The ability to catch my breath made it easier to keep going. It was a very mentally challenging experience and one I am proud of accomplishing. 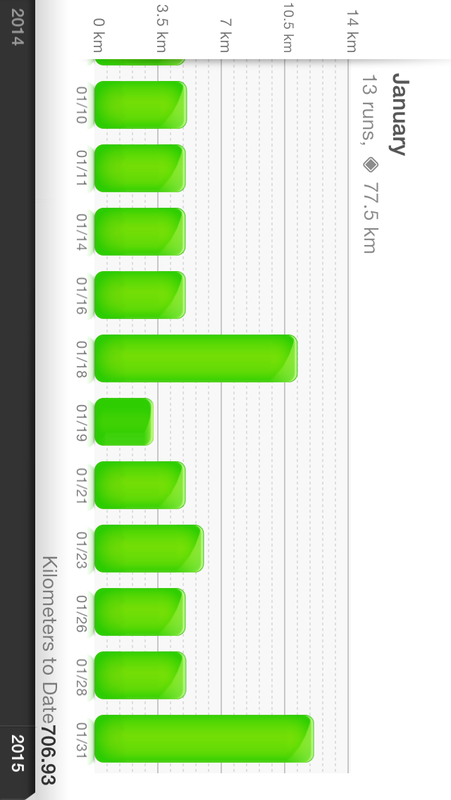 That final run of January took me very close to 80 km. Didn’t quite make it but that’s okay. I’m just happy I can run pain-free again. Day 19. National Blog Posting Month. 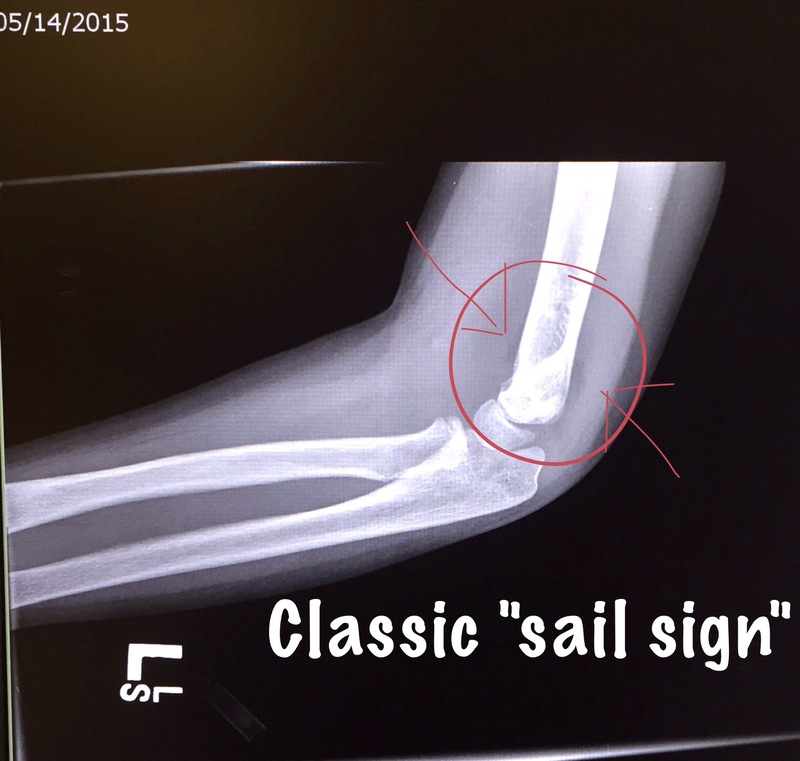 The image on the left is the acute fracture through the distal radius. 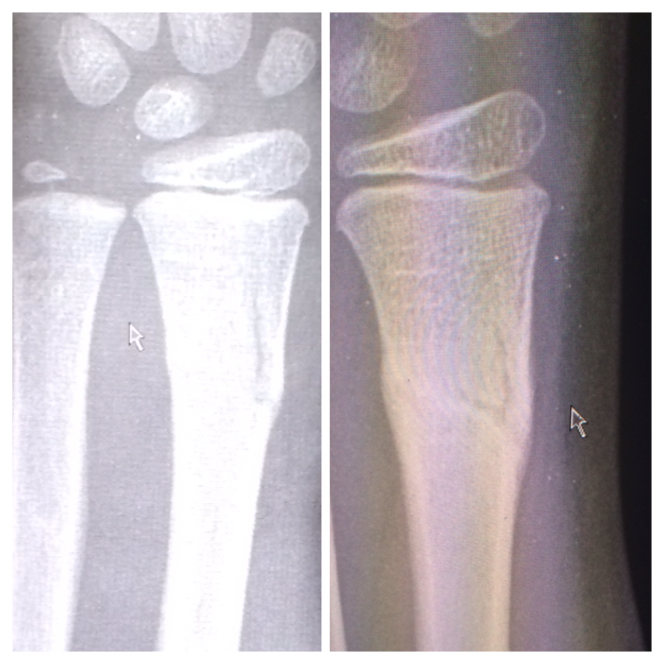 Image on the right, healing callous formation is visible as the fracture line starts to shrink. Daughter’s cast came off yesterday. I couldn’t make it to the fracture clinic appointment because of work (cue the mommy guilt) but husband took a lot of pictures. Her bone is healing, there’s good callous formation, so off came the cast and no more follow-up is needed. Her little forearm has atrophied as she hasn’t used those muscles in a month and she has some bruising on the underside of the forearm where the fracture was. She insisted the discoloration was from her putting a chopstick in there to scratch an itch but really, it’s from the fracture. I reminded her a lot today before school that she has to be careful with her arm especially in gym class. 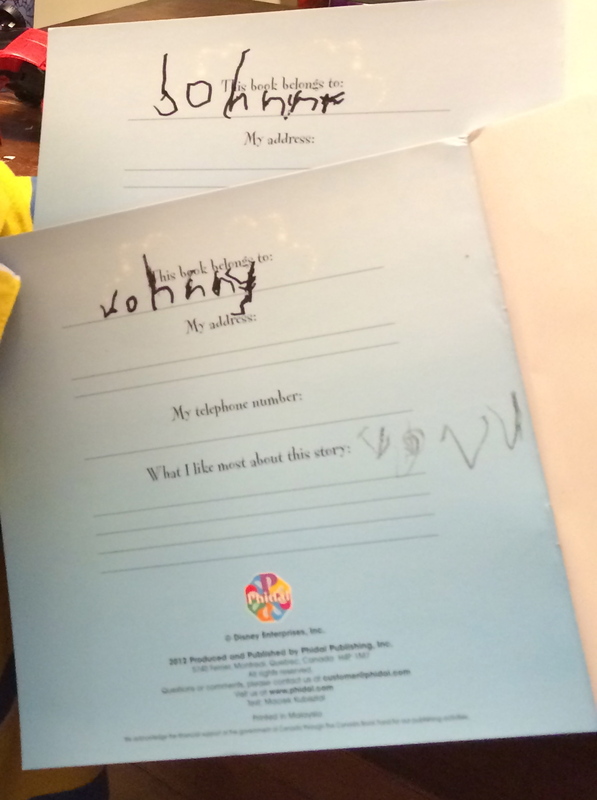 She seems to get it but the mommy in me still worries. Shouldn’t they have casted her again? Isn’t it too early for an almost-6 year old with a freshly healing bone to be running around with no cast?